Comanagement conference participants discuss farming and conservation efforts at a diversified organic operation. Fresh produce growers are challenged to protect soil and water quality on their farms as well as support wildlife populations by preserving their habitat. At the same time, growers must protect their crops from contamination by pathogens that can cause foodborne illnesses. None of this is cheap or easy, but it can be done. To help farmers and growers efficiently achieve the best results, the University of California Cooperative Extension, in collaboration with the Farm Food Safety and Conservation Network brought together 80 people on Aug. 20 for the seventh annual Food Safety and Water Quality Co-management Forum. 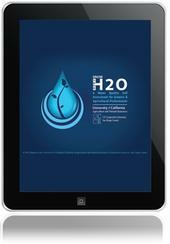 An iPad app has been developed by the UC Cooperative Extension Agricultural Water Quality Research and Education Program in San Diego. Tree crop growers have a new tool to help them assess the potential impact their growing practices may have on water quality. Know Your H2O, an iPad app developed by the UC Cooperative Extension Agricultural Water Quality Research and Education Program in San Diego, asks growers a series of questions about their growing practices, then suggests Best Management Practices based on UC research that can reduce runoff or leaching of contaminants from orchards into water. Cattle grazing and clean water can coexist on national forest lands, according to research by the University of California, Davis. The study, published June 27 in the journal PLOS ONE, is the most comprehensive examination of water quality on National Forest public grazing lands to date. The rotten-egg stink that invaded Southern California in September was blamed by scientists on an unfortunate combination of a large fish die-off in the Salton Sea, a storm churning the fetid lower levels of the sea and unusual gusts from the southeast blowing the odors toward Los Angeles, according to the Los Angeles Times. Richard Smith, UC Cooperative Extension advisor in Monterey County, samples soil for nitrogen. Drinking water is a commodity often taken for granted in the United States. When we turn on the tap, we assume the water streaming out is at least safe, if not always up to our individual taste. We expect that problems with our drinking water are isolated, temporary and newsworthy. Which may be one reason why a report released yesterday by UC Davis made headlines. According to the report, one in 10 people living in California’s most productive agricultural areas is at risk of exposure to harmful levels of nitrate contamination in their drinking water.